The colourful plastered exterior surface of Primavera contains 76 apartments to suit various life situations. The six-storey Primavera is built using modern construction technology, which ensures that energy efficiency, quality and safety are a high priority. Primavera is in energy class C2013. A common yard shared by several properties is a pleasant playground and recreational area. The colourful plastered exterior surface of Primavera contains 76 apartments to suit various life situations. The six-storey Primavera is built using modern construction technology, which ensures that energy efficiency, quality and safety are a high priority. Primavera is in energy class C2013. A common yard shared by several properties is a pleasant playground and recreational area. There is a parking facility next to Primavera, and the parking places are sold as separate shares. In addition to the residential units, Primavera houses two units of business premises. Leinelä is a new residential neighbourhood near Tikkurila and the airport, close to nature. The high-quality homes of Asunto Oy Vantaan Primavera offer carefree apartment living in a central location. The ring rail line’s Leinelä station is only a few minutes’ walk from the property. It offers convenient access to central Helsinki as well as the airport. 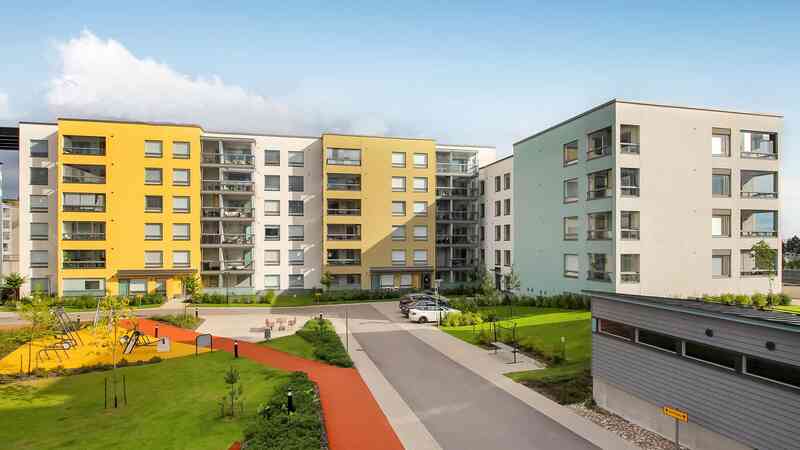 The homes in Primavera are also within walking distance of local services in Leinelä, such as schools and day-care centres. The nearest grocery store, Alepa is located right next to Primavera. The Jumbo shopping centre, Flamingo entertainment centre and Tikkurila sports park are only a few kilometres away. You can find more information in the website of the Leinelä neighbourhood. The functional apartments in this apartment block with a lift feature glazed balconies, dishwashers, ceramic cookers, parquet flooring and a 10 Mbps Internet connection included in the maintenance charge. The kitchen equipment includes white or stainless steel appliances, with countertops made from laminate for durability and ease of care. Radiant heating connected to the district heating network ensures even heating for the units, while the tiled bathrooms have electrical floor heating. The homes in Primavera also have an automated apartment-specific ventilation system with heat capture technology, as well as measuring systems for cold and hot water. Safety features include door telephones and networked smoke alarms. You can look around in one of Primavera's apartments, C 62 (114 sqm), whenever and wherever. Take a virtual tour! The company loan payment term is 23 years, of which the first three years, only the interest will be paid.